I take for granted that everyone reading this blog has at some point either given or gotten a pretty little (or large) blue tin containing some deliciously buttery, short-breadish type cookies typically referred to as Danish butter cookies. They come in lots of shapes including rectangles, pretzels, circles and more and always seem to be topped with big sugar crystals. If you are a fan of these coveted Christmas party favorites, you will surely be a big fan of Spritz cookies. You place the dough inside and press it out through different disks to create different shaped kinds of cookies. 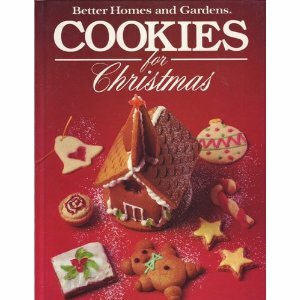 This recipe comes from my absolute favorite holiday cook book to date, the Better Homes and Gardens "Cookies for Christmas" book. I finally secured myself a used copy from Amazon this year- I admit, part of the reason this book is so near to my heart is because of the sentimental attachment. My sisters and I have a tradition of baking cookies together, usually sometime the week before Christmas. We choose several varieties and have a baking party while watching Pride & Prejudice. Now that I'm married and moved away, we only get to do this every other year, but we always have a blast. The first year this tradition started we used this cook book, borrowed from our local library! It has some fantastic, time-tested recipes and some we have tried that were instantly adopted into our family's favorites. I don't think I have made these spritz cookies before, but I have used a cookie press before. I used to make dozens of shortbread cookies with my cookie press (a gift from my grandma- my new one was a gift from my sister-in-law) and dip them in chocolate as a special after-dinner treat for my grandma (my other grandma... :)) At any rate, beware, because these cookies are addictive! They are small and adorable and buttery and crispy/soft and you won't be able to eat just one! Start with butter. Lots of butter. Use your mixture to soften the butter until it is fluffy. Add the sugar and again, mix until it is a beautiful bowl of fluffy sweet butteryness. Add in eggs, vanilla and almond extract and beat until it's blended. I used a vanilla paste my sister-in-law gave me and it adds a real vanilla bean look and flavor. Beat in as much of the flour mixture as you can, stir in the rest until it is well mixed. If you like, at this point you can tint part or all of the dough if you want to with food coloring. I did not because I was short on time, but it would be very pretty to have cookies in red and green. Do not chill the dough.Roll dough into a log that will fit into your cookie press. Attach preferred disk for desired shape. Press cookies onto pan. This takes a bit of experimentation. I got a routine down with my press, but it took a bit. Some cookies took two pumps on the handle, some only one...you'll have to find your own rhythm. Add sprinkles or candies if you like- be creative! The recipe said to bake 8 minutes, but I found that was too long for my taste. I kept it at about 5 or 6 minutes because I like my cookies a little softer. Enjoy! from Better Homes and Gardens "Cookies for Christmas"
Add egg, vanilla, and almond extract and beat well. Gradually add flour mixture and beat until well mixed. Do not chill. Tint dough with food coloring if desired. Force dough through cookie press onto ungreased cookie sheet. Decorate if desired. Bake 5-8 minutes, or to desired done-ness. Remove and cool. They look so pretty and I love this danish cookies from a tin!!! Love that Christmas plate Jenn, so cute!